$5,900 per week Off Season: 10th July - 5th November. $6,900 per week Low Season: 1st May - 9th July and 6th Nov - 15th Dec.
$7,900 per week Mid Season: 2nd Jan - 31st Jan and 1st April - 30th April. $8,500 per week High Season: 16th Dec - 1st Jan and 1st Feb - 31st March. 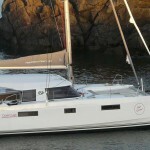 We are excited to have this new catamaran in the charter fleet. 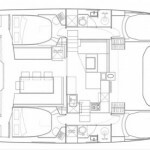 The innovative design created a catamaran that is lightweight with newly designed hulls, structural integrity and increased bridge deck clearance. She performs well in light air and sails upwind with little leeway. Easy to sail with a self-tacking jib, the Open 40 is fast. Twin helms are unique and afford the helmsman excellent forward and side visibility. The light and sensitive steering wheel enables the helmsman to enjoy the thrill of fast sailing and the performance will appeal to monohull sailors. 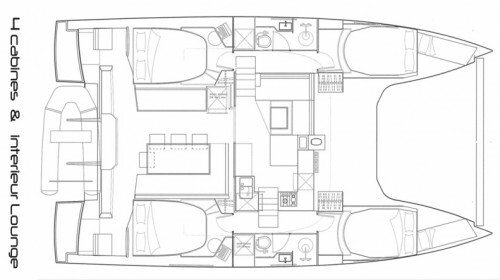 The compact salon and galley area retain all the necessary components. The U-shaped island in the galley creates a large work surface and the galley is equipped with a sink, stove and oven, refrigerator and separate freezer. The salon is actually a flexible living space with comfortable seating for four and a table used for both dining and chart work. The interior is light and airy with large windows providing a panoramic view. Ebba is equipped with a generator and air-conditioning for your comfort.